Business and Economic News » Have We Reached Peak Federal Reserve? Front Porch Punditry » News » Business and Economic News » Have We Reached Peak Federal Reserve? As the Fed-induced asset bubbles in stocks, bonds and real estate follow the inevitable Supernova track to implosion, that we've reached Peak Federal Reserve will be obvious--in hindsight. 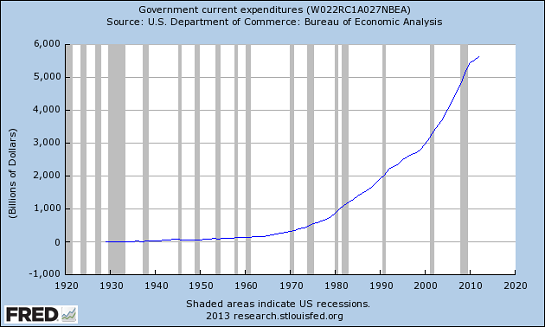 Government spending: up strongly since the Fed began pumping nearly-free credit and ample liquidity. 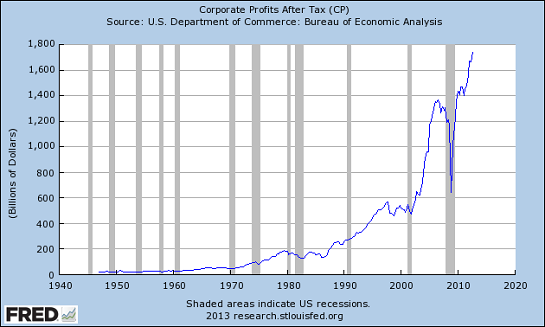 Corporate profits: soaring to new heights in the Fed-Bubble Era. 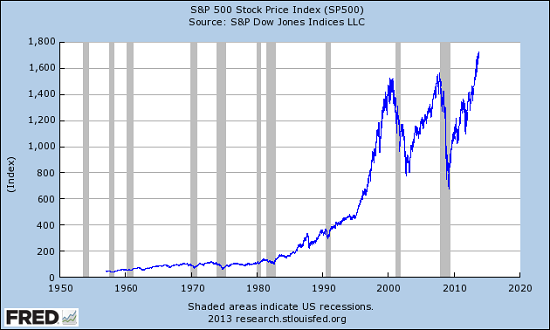 S&P 500: new nominal highs for stocks in the Fed-Bubble Era. But what about the consequences for the non-billionaire, non-government, non-financial real economy? 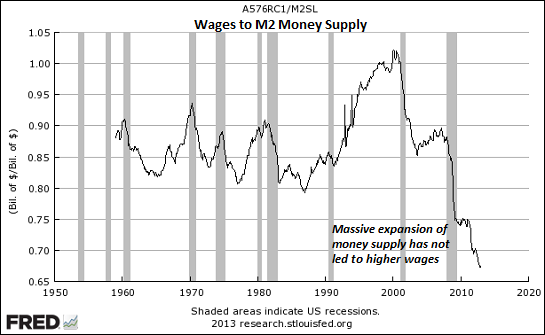 Monetary base: this is what happens when the Fed creates money out of thin air to buy Treasury bonds and mortgages. Does this look remotely sustainable in the long-term? Money velocity: in a strong economy, money velocity is high (for example, the mid-1990s) and weak in recessions (for example, 1973, 1982 and 2002). 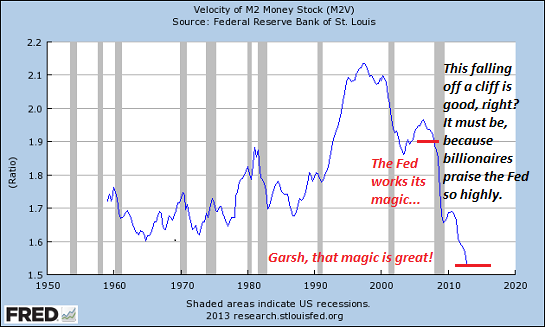 Money velocity has fallen to unprecedented levels, lower than any recession of the past 40 years. Here is household income, adjusted for inflation since 2000: it's hard to overstate how successful the Fed's policies have been in the real economy; no wonder billionaires and political toadies can't praise the Fed enough. Real household income only fell 7.2% under the Fed's billionaire-politico-friendly policies. All the Fed's goodies for the billionaires--the assets bubbles in stocks, bonds and real estate--have reached the point of "as good as it gets." From here on in, these bubbles have nowhere to go but down. As the Fed-induced asset bubbles follow the inevitable Supernova track to implosion, that we've reached Peak Federal Reserve will be obvious--in hindsight. " Note: Smith is using stats generated by the BLS. The CPI has morphed from measuring the cost of maintaining a set standard of living to the cost of maintaining a declining standard of living. Therefore the actual decline in real income is greater than Smite states.